Proptosis most commonly results from trauma to the head or neck. Learn from Critical Care Specialist Ladan Mohammad-Zadeh, DVM, DACVECC, about the steps in performing a temporary tarsorrhaphy. Proptosis is a protrusion of the globe from the boney orbit. It most commonly results from trauma to the head or neck. The degree force necessary to result in proptosis varies depending on the patient. Dolicocephalic breeds, for example, have a very deep set globe that must overcome a tremendous amount of pressure before it will proptose. On the other hand, brachycephalic breeds need only have relatively minor trauma to the head or strangulation to result in proptosis. 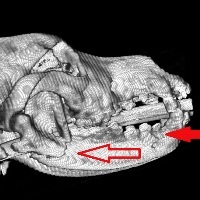 Brief excessive restraint can even result in proptosis in a brachycephalic dog. When presented with a patient with proptosis, we must remember first and foremost that a recent history of trauma is likely. Thus the first step is to examine the whole patient and perform a thorough neurologic exam to ensure there are no other issues that take priority over the proptosis such as oral lacerations, fractures, cerebral edema, or cardiovascular problems. The initial approach to the proptosed globe is triage assessment with analgesic administration (topical and systemic) as well as careful flushing with saline and lubricating the eye to prevent dessication of the globe. An E-collar is very helpful to prevent self-trauma. Once the patient is more comfortable you may proceed with a more thorough ocular examination. A complete ocular examination can be challenging on a proptosed globe depending on the degree of trauma but there are certain findings that are more and less favorable for a complete recovery. A summary of poor and favorable prognostic indicators is outlined in Table 1. Table 1. Prognostic indicators for recovery after proptosis. Unless there is obvious globe rupture, globe dessication or visual damage to the optic nerve, it is always recommended to replace the globe, perform a tarsorrhaphy and re-evaluate at the time suture removal. 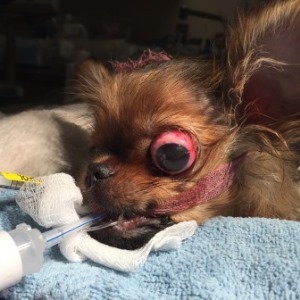 There may be limitations on the client’s end that would make enucleation the best option right away such as patient compliance (difficult to medicate pet, or mostly outdoor pet), finances and the desire for limited follow up. Once you have completed your examination and decided globe reduction and tarsorrhaphy is the best treatment choice, you will need to prepare for the procedure. Anesthetic options are numerous but you should consider general anesthesia as opposed to heavy sedation with injectable medication. General anesthesia will reduce the risk of patient movement or the need to stop mid-procedure to re-dose if the injectable medication is inadequate. Figure 2 illustrates the items you will need. 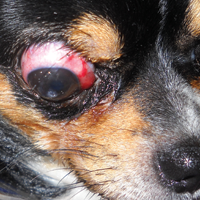 The fluorescein stain is helpful to identify the severity of corneal ulcers and may help you decide if the pet can receive steroids upon recovery. Minimal instruments are needed and include needle holder, suture scissors, and non-traumatic forceps. Suture size in general should be on the smaller side, 3-0 to 5-0. Nylon or silk suture on a cutting needle is recommended for the tarsorrhaphy. As illustrated in Figure 1 there are options for stent material including red rubber catheter, rubber band or IV tubing. Stent placement is optional but recommended if a significant amount of tension is anticipated at the lid margin. Here are the steps in performing a temporary tarsorrhaphy. Figure 2. What you will need to perform a temporary tarsorrhaphy. Prepare the globe. Gently shave the skin around the eye. Be extremely careful not to further traumatize the globe. You may use small sharp scissors and manually clip smaller hairs along the lid margin. Scrub the skin with dilute betadine solution – solution contains saline and is safer to use in case there is direct contact with the globe. Gently flush the globe with saline to facilitate debris removal. Apply a generous amount of sterile lubricant to the entire surface of the exposed globe. Reduction of the globe. Reduction of the globe is generally successful using the flat portion of a scalpel handle to apply gentle constant pressure on the globe (Figure 3). If there is significant periorbital swelling, a lateral canthotomy may be useful in facilitating globe reduction. Stay sutures can be placed along the top and bottom lids as well to provide outward eyelid traction as the globe is being reduced. Once the globe has been reduced, you may again flush gently with saline. Figure 3. Reduction of the globe using a scalpel handle. Tarsorrhaphy. It is common to place stents, but it is not always necessary. Horizontal mattress pattern can be used, or a simple interrupted. Regardless of the suture pattern used, it is important to place the sutures in such a way to reduce inward rolling of the lids which could result in suture contact with the globe and further ulceration. Figure 4 illustrates the horizontal mattress pattern with the use of a rubber band stent. The first pass of the needle is through the stent on upper lid approximately 5-7mm from the lid margin and exits at or near the Meibomian gland. The needle then enters at or near the lower lid Meibomian gland and exits the skin and/or stent approximately 5-7mm from the lower lid margin. The reverse pass is made until the mattress is complete. The knot is tied on the upper lid. Depending on the length of the lid, it may require 2-4 mattress sutures to complete the tarsorrhaphy. A few millimeters should be left open at the medial canthus to facilitate administration of topical medications. If a lateral canthotomy was performed, it should be closed using nylon or silk suture in a simple interrupted pattern. Figure 4. Completed tarsorrhaphy with slight opening at the medial canthus for medication administration. Home care. Pain management, reduction of self-trauma, and topical and systemic medications are all part of home care. An E-collar should be mandatory until suture removal to reduce self-trauma. Options for oral pain medication could include a narcotic such as tramadol or codeine. Non steroidal anti-inflammatories could be considered if steroids are not being used. Both topical and systemic antibiotics are recommended, as is the use of 1% atropine q12 hrs, each for 7 days. The decision to use steroids may depend largely upon the presence of corneal ulcers at the time of the tarsorrhaphy and the presence of uveitis. Steroids can be administered topically, orally or both simultaneously. Consultation with an ophthalmologist is always recommended if you have questions regarding post operative care and follow up. Follow up. The sutures should stay in place for a minimum of 2 weeks, some advocate for 3 weeks. There are two strategies for removing the sutures. If there was minimal trauma or swelling and the initial reduction was easy, you may remove all of the sutures at the same time. Other times you may prefer sequential removal of the tarsorrhaphy sutures in order to reduce the risk of sudden re-proptosis and to better evaluate periobital swelling. If there is still significant swelling, then keeping the last 1 or 2 sutures in place for additional days may be helpful to reduce risk of complications. Once all of the sutures are removed, you may perform an ophthalmic exam to evaluate for return of vision, globe movement, presence of ulcers, etc. Mild strabismus may be noted that can be normal and last for several weeks. Prognosis. Prognosis is extremely variable and can be good if there is minimum damage to the globe and vision and light response is intact. However client education regarding prognosis and expectation is very important. They should be prepared for the possibility that their pet may remain non-visual or have permanent strabismus. Ongoing uveitis can result in longer standing complications as well and follow up with an ophthalmologist may be recommended.